No matter how big the inside of your fridge is, it seems like the amount of stuff you keep in there will expand to fill the space – and then some. 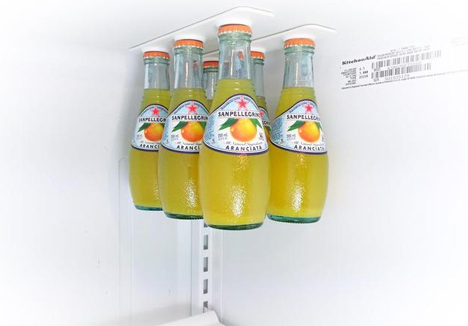 This rather clever invention gives you a little more storage room in the icebox by suspending your bottled drinks from its ceiling. Using ultra-strong neodymium magnets, the BottleLoft from designer Brian Conti lifts bottles off of the shelves to make space for important stuff like leftover pizza. Each BottleLoft consists of an eight-inch-long plastic rail with three embedded neodymium magnets graded N52, the strongest you can get. 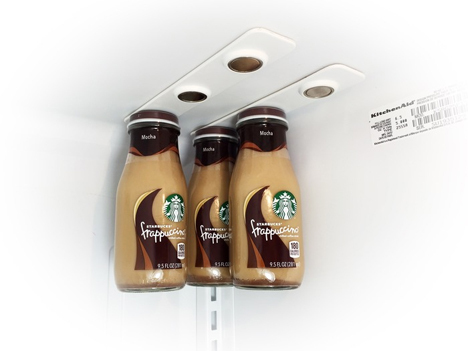 The whole assembly attaches to the roof of your fridge with a specially designed adhesive strip that is specifically meant for cold environments like the inside of a refrigerator. 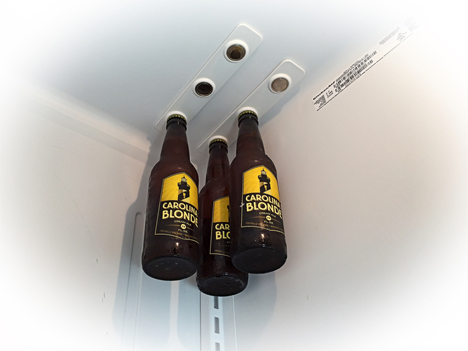 Once you clean off the surface with an alcohol wipe, you stick one side of the adhesive to the fridge and then stick the BottleLoft to the other side. 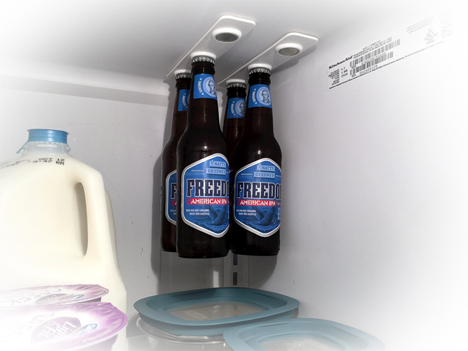 You can install several so your fridge can hold a six-pack or two of bottles. The adhesive can later be scraped off with a putty knife if you need to remove it. The only drawback here would be for people who prefer to drink from cans rather than bottles, but there are other products out there for them. 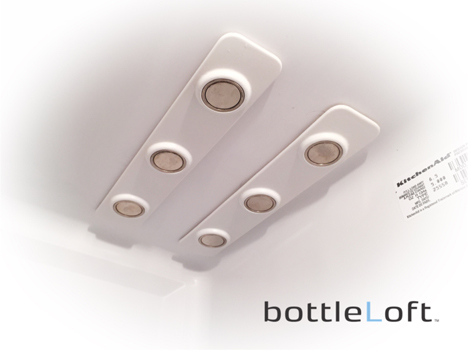 The BottleLoft is on Kickstarter with a modest goal of $20K which it quickly surpassed.